Happy Sunday, I hope everyone is having a great weekend. Today I have yet another Christmas card to share....apologies but there is going to be alot of them over the next month or so. This card was based on the great sketch by Jen T over at Freshly Made Sketches I love their sketches and have enjoyed playing with them over the last month or so. For this card I decided to use some die-cuts instead of my usual stamped images. I decided to move away from traditional christmas colours and used these bright papers from MME. I attached the snowflakes with foam dots and the buttons with glossy accents. I also covered the snowflakes with clear Wink of Stella pen, which is hard to pick up from the photo. I noticed after the card was finished that the sentiment is slightly squint - whoops!!! That is what happens when card-making and watching TV at the same time! Oh well, it is just going to have to stay that way! The sentiment is also stamped with an extremely old stamp set!! I bought my first lot of christmas card supplies way back in 2007 when I slightly flirted with card making. I never seemed to have the time to do it though, my job was stressful and then I decided to take off and travel the world, so my supplies sat in a box in storage for years! Last year when I make a trip back home to the UK I brought back alot of supplies - I am so glad I held onto everything! Enjoy the rest of your Sunday and thanks for looking. A very crisp and elegant design Andrea. Thanks for sharing your creativity with us at Allsorts challenge this week. 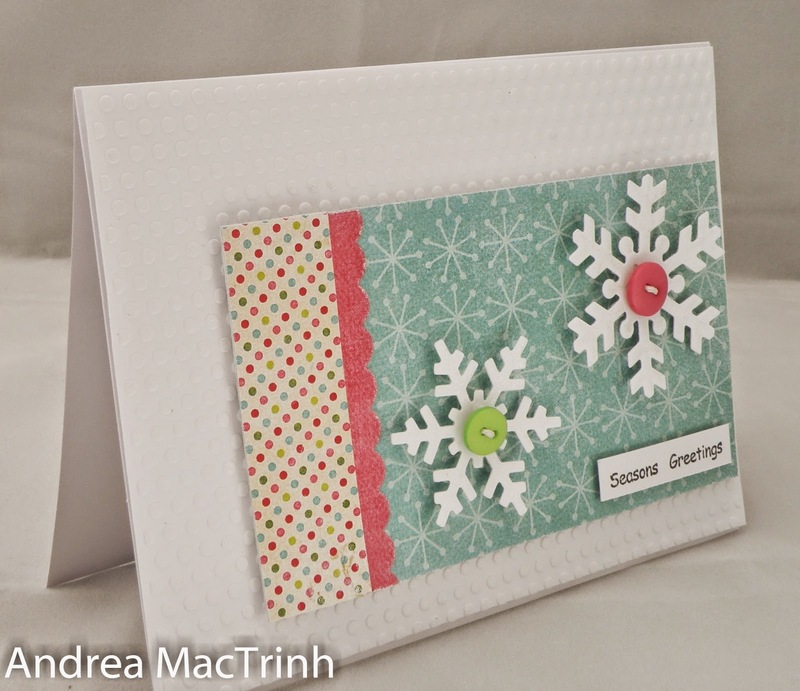 I love the die cut panel against the embossed white base - fabulous card! Thanks so much for joining us at Freshly Made Sketches. Love this, Andrea! Your detailed image panel against the white background is awesome! Glad to see you this week at FMS! Love the paper combination on this! So soft and sweet with the polka dotted background! I love your mix of colors - the blue is clearly perfect for the snowflakes, then adding the green and red buttons and polka dots makes it so festive. Thank you for playing along with us at Freshly Made Sketches! 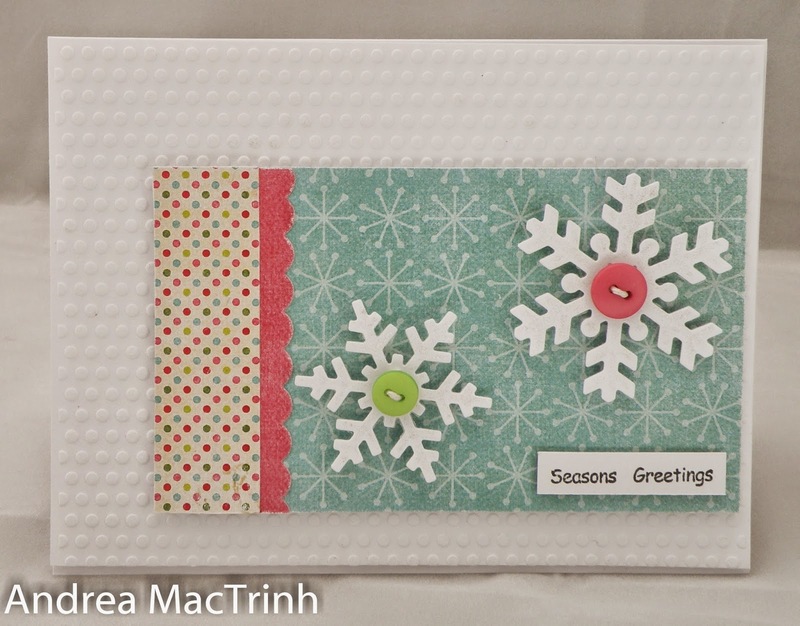 Thank you so much for participating in our embossing challenge at Allsorts this week!